53 km distance bridged in DMR direct mode – from stub antenna to stub antenna! Most radio amateurs only use DMR via relays or hotspots. Direct contacts on a simplex frequency are rather the exception. Too bad, because for me these (still) rather rare direct contacts are more attractive than QSOs via a digital relay. I can count my direct mode DMR QSOs on one hand. So far there have been only two QSOs. And both connections had to be arranged and initiated before over another channel. The first QSO of this kind I had in April 2017 with DF1JSF. The distance of this connection was about 33 kilometers. 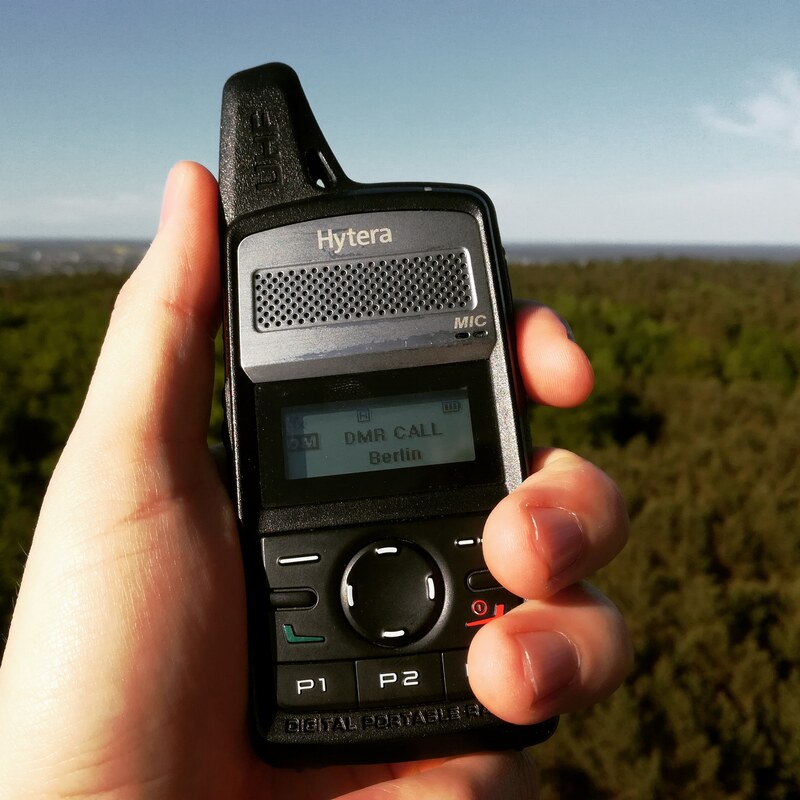 As transceiver I used the Hytera PD365 on my side. In May 2018 I had the second DMR Simplex QSO with Max, DG1TAL. This time a distance of about 53 kilometres was bridged. 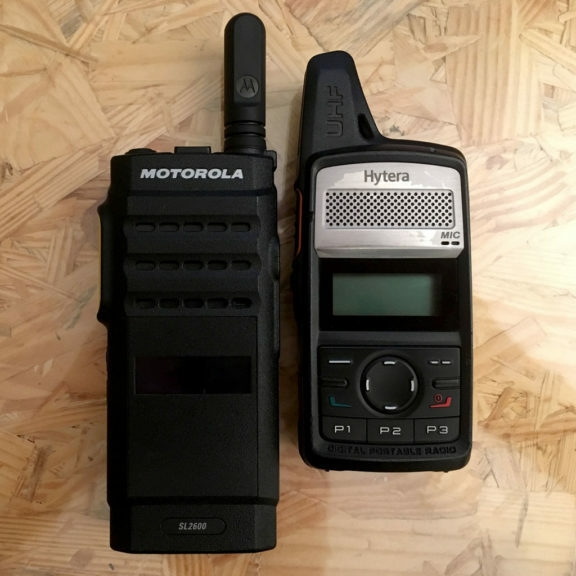 I used the Hytera PD365 again and Max used the Motorola SL2600. Since both radios were operated with the original stub antenna, an elevated location on both sides was necessary. I stood on the observation tower in the Rauener Bergen and Max was on the roof of the Technische Universität Berlin. The graphic for the elevation profile was created with the tool for link distance calculation. With the admittedly privileged locations chosen here, such connections are to be expected – as we know from FM. But in order for a DMO connection to work at all, the radio must of course be configured correctly on both sides. Codeplugs often contain only a few frequencies for direct mode. Many codeplugs do not contain any such frequencies at all, but this takes away the possibility of a spontaneous DMO contact. At least the DMR call frequency simplex frequency should be present in every code plug. If it is missing in your CP, please take a few minutes and enter it. Because at the latest on the HAM RADIO there are possibilities for spontaneous DMO connections. These channels should also be entered according to the same scheme because they have been copied from code plug to code plug for quite some time and have found a high distribution. The probability that the remote station has also configured these channels makes a frequency change possible, if necessary. If you want to know more about the simplex frequencies for DMR, you should read this article by Max (DG1TAL). In his blog you will also find a PDF file with all DMR frequencies in the 70cm band. With the advent of various inexpensive DMR devices that allow true VFO operation, direct-mode QSOs will tend to increase. Also the fact that some devices will come along as Duobander will contribute to the fact that the operation in direct mode will increase with increasing distribution of these devices. I work at a IT service organisation and mostly administrate mailservers and linux servers. I am currently engaged with VHF / UHF, APRS and HAMNET. In addition, I am gaining experience in antenna construction.